A class designed to give middle school students, ages 11 – 14, the tools for effective communication and increased confidence. 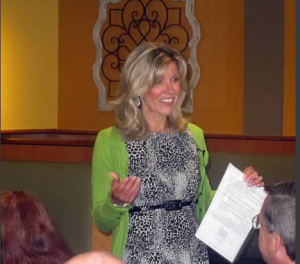 We’ll review greetings and introductions, first impressions and image, conversation skills, listening skills, public speaking, telephone, texting and on-line etiquette and thank you notes. All topics are presented in a fun, interactive way that engages our middle schoolers! These are the years where better communication is expected of the kids socially. Give your child a leg up and increase his/her comfort level. OMG! In this two hour course, we’ll discuss modern manners for modern communication that includes texting, e-mail, cell phone and IMing. The class is designed for teenagers ages 12 16 who utilize these forms of technology to chat with friends and family. Participants will develop a list of Do’s and Don’t based on what they might experience/observe first hand in their world. TTYL! Designed for middle schoolers age 11 – 14, this fun and interactive combination course is designed to give students confidence in social situations and at the dining table. It will increase their knowledge and comfort level in various areas of social etiquette, such as first impressions, introductions, gift giving/receiving and behaving as a good host & guest. The second portion of the course will focus on table manners, allowing them to handle themselves and others with ease in any dining situation, whether formal or informal. 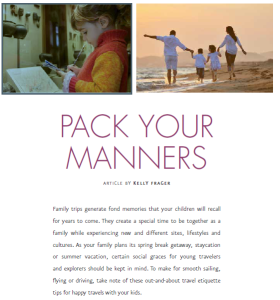 Classes are focused on good manners and common courtesies that your child will use today and everyday. A wonderful BIG picture class that touches on a bit of everything. Do you cringe at the thought of your son or daughter having dinner at a friend’s house; taking a date out to eat; or just every night as you watch him wipe his mouth with his sleeve – still at age 15!? This is the course they need! 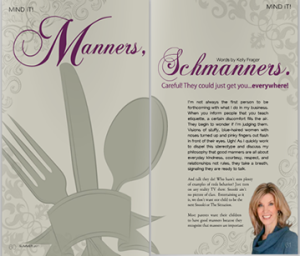 Whether informal or formal, every person needs to exhibit mealtime manners. In this class, held at a local restaurant, we’ll examine the mealtime mechanics and social aspects of being a well-mannered dinner. Both the mechanics and the art are integral to every shared meal regardless of formality. So sit up straight, put your napkin on your lap and let’s enjoy eating together! Hop on board as we hit on all the major areas of communication and social etiquette in just four hours! Your high school student will learn all the finer aspects of making a positive first impression through their communication skills, dress and behavior. We’ll discuss the do’s and don’ts of cell phones, texting, e-mail and still learn all the social graces that will give him/her the confidence they need as they develop into an adult.